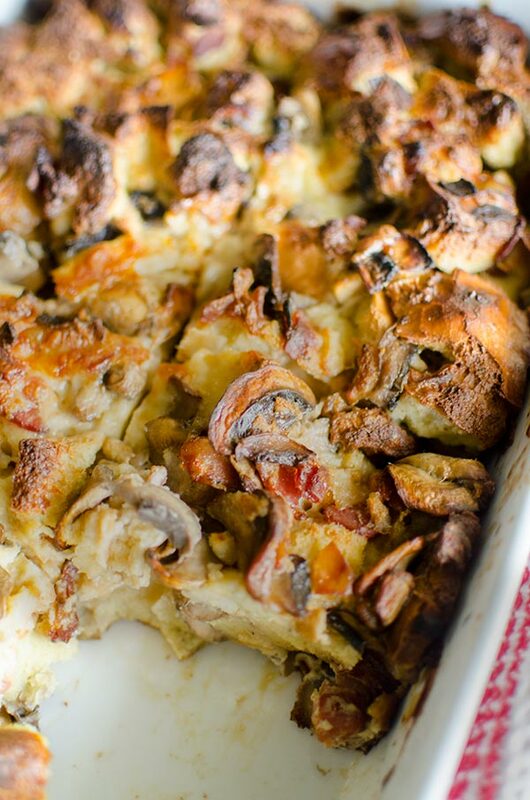 Serve the ultimate holiday brunch with this no-fuss and simple recipe for overnight smoked cheddar, bacon and mushroom strata. The holidays are an insanely busy time of year, but they are also a magical time to celebrate and be surrounded by friends and family. I’m really excited to be partnering with Egg Farmers of Canada and their network dedicated to all things egg called EggcentricTV this holiday season to showcase ‘Recipes That Give’ in partnership with Food Banks of Canada. 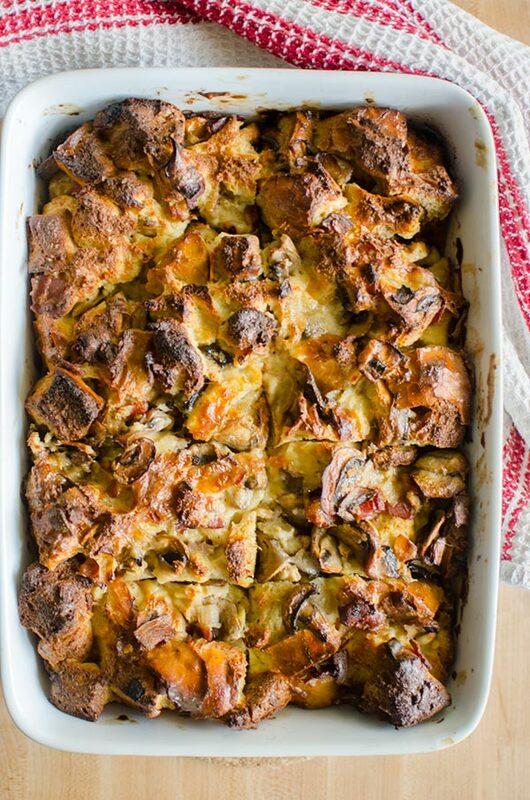 This smoked cheddar, bacon and mushroom breakfast strata is the perfect recipe to share with your loved ones this holiday season. Giving homemade food to my friends and family is my favourite way to say ‘Thank you’ and to show them how much I appreciate and care for them and everything they do for me. I’m so lucky to be surrounded by such an incredible support system who are always here to lend a hand when I need help, and offer their words of advice and encouragement. This strata recipe has been making its way around to all of my people, both in the warm, fresh-from-the-oven form and in the straight-from-the-fridge with detailed baking instructions form because you can prep this breakfast strata the night before and either bake it off in the morning or drop it off with printed cooking instructions. It begins with eggs and bacon, like all delicious breakfast recipes do and gets elevated by the simple addition of high-quality smoked cheddar cheese. I’m also excited to be back with a new video showing you just how easy it is to make this recipe yourself. The final recipe and the full-length video is featured on EggcentricTV, simply download the free EggcentricTV app (available on App Store and Google Play) or on Roku and go to the Holiday #RecipesThatGive channel and enjoy! Whisk eggs with half and half in a large bowl, set aside. Heat a large skillet over medium heat, add olive oil and onion. Cook, stirring frequently for 3 minutes or until lightly browned, add garlic and cook another minute. Add mushrooms, cook until browned and most of their liquid has been released, about 8 minutes. Remove from pan and wipe clean. Set aside. Heat pan over medium heat, add bacon and cook until crispy, about 6-8 minutes, stirring frequently. Drain fat and remove to a paper towel lined plate. Stir bread, mushroom mixture, bacon and smoked cheddar into egg mixture. Season with black pepper. Carefully pour mixture into an oven-proof 9x13” baking dish. Cover with foil and refrigerate for 8 hours or overnight. Preheat oven to 350F, allow strata to rest outside of the fridge for 20 minutes. Bake, uncovered for 40-45 minutes. Remove from oven and allow to rest for 10 minutes before serving. Disclosure: This post was sponsored by Egg Farms of Canada – as always, all opinions are my own. Thank you for supporting my sponsors and allowing me to continue creating recipes like this smoked cheddar, bacon and mushroom strata. Thanks Lou. This is a great idea for a Boxing day brunch as it sounds so tasty and easy to prepare! Thank you Fiori, I hope you enjoy! Thanks Suzie, let me know how it goes! Looks amazing. I will make it for Christmas morning. Thank you Mary, I hope you enjoyed it! it look so delicious being a bacon lover! It is also convenient to know you can freeze if or prep the next morning! I'm so glad that you enjoyed it, thanks Pat! Looks delicious ...will try soon. Hi Angelina, I'll answer this question here as well in case someone else has the same question, for half and half, it's 10% milk fat. I hope you enjoyed it! Yummy. I will pass on the link. Thanks Rita! Glad you enjoyed.